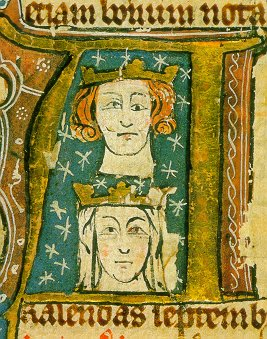 Edward I (Longshanks) was the eldest son of Henry III and his queen, Eleanor of Provence. Edward was born in 1239 and at the age of only ten he was named governor of Gascony. In 1254, Edward was married to the Princess Eleanor of Castile. Edward began to take a prominent role in matters of state during the latter part of his father’s reign. There is no doubt that he displayed great ability to make quick decisions and he was not beyond treachery when needed to serve his purpose. In the barons’ war, which began in 1261, he had generally the conduct of the royal forces; was defeated and taken prisoner by De Montfort at Lewes, in 1264; escaped the next year, and defeated De Montfort at Evesham, thus securing the liberty of his father, and ended the war by the reduction of the Isle of Ely in 1267. He soon after took the cross, and set out to join St. Louis in the crusade, but did not arrive in the Holy Land till 1271. After various successes and a narrow escape from assassination, his wife, it is said, sucking the poison from his arm –he set out on his return, arriving in England in August, 1274. He had been proclaimed king on the death of his father nearly two years previously, and was crowned, with his queen, soon after his arrival. War filled up the greater part of his reign. The principal events are the conquest of Wales and the wars with Scotland. Llewellyn, prince of Wales, refusing to attend the English parliament and do homage, was defeated by Edward in 1277 ; and having again revolted, was again defeated, and at last slain in 1282. Edward built many castles in Wales, and settled the government by the statute of Rhuddlan. Edward I is also remembered for his persecution of the Jews and ultimate banishment from England, He treated the Jews with great cruelty and injustice, hung hundreds of them on a charge of clipping the coin, and in 1290 banished them. However, Edward I had borrowed from the Jews extensively at a time when there were no government bond issues or debt market. Edward also borrowed extensively from the Italian bankers known as the Riccardi family who had the ability to lend vast sums of money to the English Crown because they were a medieval quasi-primary dealer raising money for the king among the other banking houses of merchants in Italy. As Edward I began to engage in war with the Welsh, First War 1276-1277 followed by the Second War 1282-1283, he relied upon the Riccardi to provide the funding secured by the right to collect customs taxes in Ireland and England. The Riccardi raised funds on the continent among the Italian merchant-banking houses. The Welsh campaigns were fully funded by this banking arrangement. Kaeuper reported that in 1277, funds had been raised “from fifteen companies, totaling 13,150 marks.” (p202). which was 8,766 pounds. Then there was in Wales the event known as the Rhys ap Mardudd Rebellion, which took place in 1287. Again, the English Crown turned to the Riccardi of Lucca to provide the funding. However, Edward I had also started to borrow from the Jews in England. In order to provide this funding, the Riccardi were given the right to collect taxes controlling the English and Irish customs tax on exports. Nevertheless, there was clearly a distinction that funding the war with the Welsh was one thing. However, in 1294, war broke out with the French. That created a serious problem for the Riccardi. Just on the surface, war with France interrupted the line of communication between England and Italy and disrupted the merchant-banking interbank market as a whole. When Edward I returned to England in 1289, he was confronted by corrupt judges and dismissed them summarily. Then in 1290, Edward I seized all the property of the Jews and expelled them from England. It was one thing to assert the Jews were not Christian, and another to use that as the pretense claiming they had violated his previous ban on usury, when in fact he was an excessive borrower himself. Edward I not only banished the Jews, he then decreed that all their assets were now his and those who they had lent money to now owed the crown. This seems to be a profitable decree disguised as law. The Jews were not allowed in England until Oliver Cromwell permitted them to return to England in 1655 by refusing to extend Expulsion Laws imposed roughly 300 years earlier by Edward I in 1290. In 1291 the numerous competitors for the crown of Scotland submitted their claims to Edward’s decision, which was in favor of John de Baliol. Baliol paid homage to Edward, and was made to feel his dependence too keenly; so that war soon broke out between the two kingdoms. Then came the terrible devastation of Scotland, temporary submission, insurrection of William Wallace (? – 1305), his victory of Stirling, his defeat at Falkirk, numerous invasions and truces, capture and execution of the great patriot leader, fresh revolt, and coronation of Robert Bruce in 1306, and a final expedition against the Scots in the following year, which was cut short by the death of Edward at Burgh-on-the-Sands, near Carlisle, 7th July, 1307. Very great and important legislative changes took place in this reign. Edward left by his first wife, four sons and nine daughters; and by his second, Margaret of France, whom he married in 1299, two sons and one daughter. Margaret survived him. Pingback: most expensive jewelry - Is it a Scam?